“In God’s Own Country” tells the story of Henry Muhlenberg and the beginnings of a Lutheran church in America, but without simple understanding of the historical context and the main characters involved, it can be quite confusing. Take ten minutes to read through the following and your experience at the play will be enhanced significantly! Muhlenberg is faced with five significant challenges when trying to establish the church in the early 1740s. Each challenge is addressed in its own scene during the play: the challenge of organizing a distinctly Lutheran Church (spelled out in the controversy with the Moravian Germans), rogue preachers who were canvassing the colonies in order to make a quick buck, raising a family in colonial America, the Indian controversy that eventually led to war, and the absence of printed Bibles and worship books (and thereby Lutheran liturgy) that they could rely on. An over-arching challenge was that of language – whether to create a German language church or embrace the English language. There is a significant character attached to each challenge: Zinzendorf (the Moravian-Lutheran leader), Franke (the church leader in Halle, Germany), Conrad Weiser, the Indian Chief Flying Arrow, and Benjamin Franklin. I was also given some good advice about the challenge of understanding the German. Think of it as an opera. You never understand what’s being said, but the actors help convey the message. CONTEXT: Denominations were non-existent in the early days of Colonial America. Church communities existed, of course, but very few were led by trained pastors and even fewer had the resources to build church structures. A group of struggling German Lutheran communities in the Philadelphia area appealed to their elders in Halle, Germany, for assistance. In 1742, the Rev. Heinrich Melchior Muhlenberg (Henry) accepted the call and made the cross-Atlantic journey to Philadelphia. From the get-go Muhlenberg experienced trouble, most notably a disorganized and poorly funded church, and the widespread problem of self-appointed, non-ordained “ecclesiastical tramps” who tried to exploit leader-less churches. More broadly, Muhlenberg found himself in a tug-of-war with Count von Zinzendorf, a powerful leader of Lutheran-Moravians in Philadelphia. MUHLENBERG AND COUNT ZINZENDORF. To establish his authority, Muhlenberg relied on his superior credentials, for he had been sent by the church elders of Halle and, by extension, the king of England (ruler of Hanover as well). As a result, he presented himself as the “official” missionary of Halle to fill the Philadelphia congregations’ proper request for a pastor. Zinzendorf was none-too-happy. He was a man of social and religious stature who led a blameless life of piety and self-sacrifice and was an ordained Lutheran minister. His goal of uniting Christians of all denominations under the ecumenical Moravian umbrella, however, was anathema to Muhlenberg, whose allegiance was to the traditional Lutheran Church. There were several examples of Lutherans and Moravians jostling over authority and church buildings, but eventually the mighty Zinzendorf backed down in deference to Muhlenberg’s credentials and his official licensure to the Philadelphia congregation. MUHLENBERG’S FIRST FEW YEARS IN AMERICA. Although not mentioned with much detail in the play, the first three years of Muhlenberg’s ministry were remarkably fruitful. With incredible tact and a willingness to travel far and wide, Muhlenberg founded new churches and brought old congregations together. He attracted a stream of well-trained and devoted ministers to whom congregations naturally gravitated. He preached widely and constantly, in German, English, Dutch, and Latin. He did his best to avoid public controversies which might drive some away from the church, instead focusing on proper orthodoxy and the formation of a common worship liturgy. He placed heavy emphasis on catechizing the unchurched, rallying congregations to erect or enlarge church buildings for regular worship. It did not hurt his standing that, in 1745, he married the pious daughter of Conrad Weiser, the commissioner of Indians affairs for Pennsylvania. Henry and Anna Maria (Mary) had eleven children, all of whom survived to occupy prominent positions (more on that later). CONRAD WEISER. Mary’s father plays a significant role in the play, although historically not much is written about Weiser and Muhlenberg, except that Weiser was a strong advocate of his son-in-law’s efforts. Nonetheless, Weiser was a significant figure in Pennsylvania history. A statesman and peacemaker, Weiser embraced William Penn’s “holy experiment” to build a colony of tolerance and brotherhood among all national, racial, and religious groups. Weiser’s work among the native Americans was well-known and highly respected, undoubtedly influenced by the Mohawk Indians of New York, with whom he lived while a youth. Later in life he negotiated a number of peace treaties, most notably a treaty between the Delaware tribe, the Six Nations confederacy, and the Pennsylvania colony. The treaty brought a level of friendship between the Six Nations and the colony, which served England well during the French and Indian War. The treaty and conflict are highlighted in the play. In fact, Weiser’s funeral serves as the play’s final scene (well, sort of), a clear sign of respect for the passion and accomplishments of Muhlenberg’s father-in-law. MUHLENBERG’S LEGACY. Although the play does not explore the lasting effect of Muhlenberg’s work, it should be noted. Muhlenberg’s motto (“We must plant the church”) came to fruition in 1748 when six Swedish and German pastors and twenty-four lay delegates met in Philadelphia to form the Pennsylvania Ministerium. Guided by Muhlenberg, it outlined a synodical organization, prepared a book of common prayer that lasted into the nineteenth century, and wrote model constitutions for the fast-growing and spreading Lutheran congregations. Although not all founded by Muhlenberg himself, “Muhlenberg churches” popped up throughout Pennsylvania, the Shenandoah Valley of Virginia, and North Carolina. 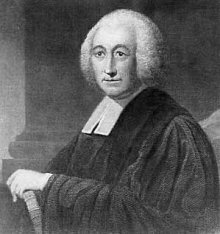 Muhlenberg died on 7 October 1787, the same year that the Lutheran and German Reformed Churches joined forces to found Franklin College in Pennsylvania with his son the Reverend Henry Ernest Muhlenberg as president. The couple had eleven children and founded the Muhlenberg Family dynasty, where generations were active in the US military, politics, academia and ministry.